Netflix's plans to spend $8 billion on content this year will keep its cash flow deeply in the red, but investors continue to reward the streaming service's ambitions with record high share prices and a $100 billion market cap. Netflix Inc. (NFLX - Get Report) shares surged sharply higher in premarket trading Tuesday after the online media group smashed Wall Street estimates by adding more than 8 million new customers to its streaming service and pledged to spend billions more on content to keep them from switching to rival providers such as Amazon Inc. (AMZN - Get Report) and Walt Disney Co. (DIS - Get Report) . Netflix added 24 million new subscribers last year, the company said after the close of trading Monday, up 26% from 2016 to take its worldwide total to 117.6 million, less than half of which are in the United States. Revenue for the three months ending in December, the company's fiscal fourth quarter, was pegged at $3.29 billion while earnings 41 cents a share. Both figures were largely in-line with analysts' forecasts. The Los Gatos, Calif.-based group also said it would increase its spending on content -- including original productions -- to $8 billion this year, a move that lifts its total commitment to around $18 billion. Netflix will also increase its marketing budget to around $2 billion. "We believe our big investments in content are paying off," the company said. "Big hits like 13 Reasons Why, Stranger Things and Bright result from a combination of great content and great marketing ... we want great content, and we want the budget to make the hits we have really big, to drive our membership growth." Netflix shares rose 9% in premarket trading in New York Tuesday, indicating and opening bell price of $248.07, a record high that would extend the stock's three-month gain to just over 27.5%. The moves will also take its market capitalization past $100 billion for the first time ever, taking it past rivals such as Time Warner Inc. (TWX and 21st Century Fox (FOX and ranking it just behind Action Alerts Plus Comcast Corp. (CMCSA - Get Report) and Disney on the list of America's biggest media companies. Looking into 2018, Netflix wants to add a further 6.35 million subscribers over the first three months of the year, the bulk of which (4.9 million) will come from markets outside of the United States. It's also targeting an operating margin of 10%, a 300 basis point increase from last year. 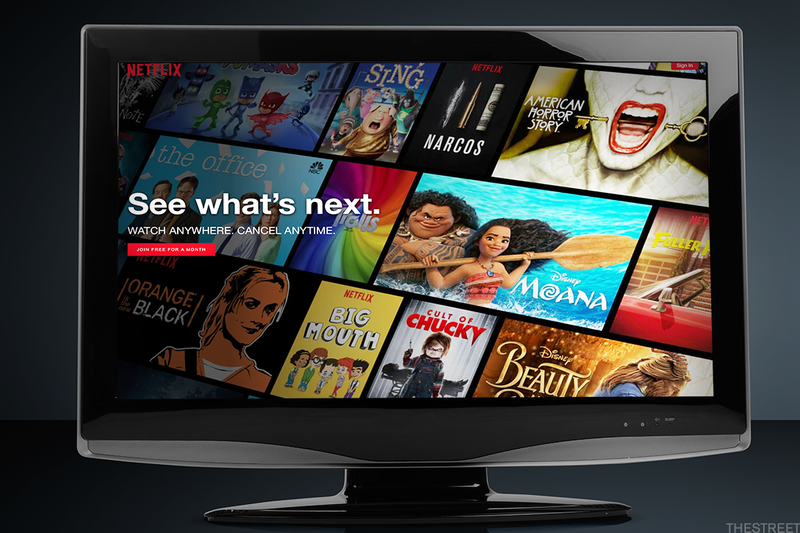 The group's content spending plans, however, mean it will have a negative cash flow of between $3 billion and $4 billion this year, more than double the 2017 figure, with some analysts concerned Netflix won't be cash-flow positive until at least 2022. However, as TheStreet's Eric Jhonsa wrote Monday, markets don't seem bothered by Netflix's spending spree, "at least not while subscriber growth remains torrid." "Much like Amazon and Action Action Alerts Plus holding Facebook (FB - Get Report) , Netflix's execution has helped earned it a green light to make giant cash flow-depressing investments. Here, it also doesn't hurt that the company had just $3.7 billion in net debt at the end of 2017, a figure equal to less than 4% of its current market cap," Jhonsa wrote. "One does have to wonder, though, to what degree Disney's plans factor into Netflix's budgeting. Over the last five months, the media giant has unveiled plans to pull ts films from Netflix at decade's end, launch a Disney-branded streaming service in 2019 that will be the exclusive home of Disney, Pixar, Marvel and Star Wars films and inked a deal to buy most of Fox's assets for $52.4 billion. All of that gives Netflix fresh incentives to spend more on both content and customer acquisition ahead of the Disney service's launch."